Industrial art groups and large scale projects are no strangers to the Bay Area, but it’s not often that several of these groups collaborate on something so large they couldn’t do it alone. 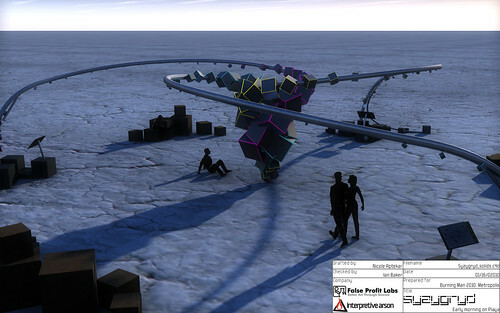 Syzygryd is a 2.5 ton interactive, collaborative musical instrument that breathes fire. This Burning Man Honorarium project is being created through the combined efforts of Interpretive Arson, False Profit Labs, Grey Area Foundation for the Arts, and Denmark based Illutron. Syzygryd is an interactive metal sculpture measuring 60 feet in diameter and 13 feet tall at its highest point. It consists of three giant spiraling metal arms that join into a tornado of cubes in the center of the space. At the outer edges of the sculpture are three touchscreen grid sequencers (think of a giant 4 foot wide Tenori-on) which allow people to visually compose music together. The touchscreens are also connected to DMX controllers which sequence 1.5 kilowatts of LEDs and an array of flame effects, including a 20 foot fire tornado in the center. In short, the music composed by three strangers will be translated into fire, light, and sound. There is a Kickstarter going to help put the fire in Syzygryd. In addition to helping bring more fire into the art world, you’ll also score some great rewards for your pledge. The goodies range from stickers and t-shirts to a handheld flamethrower and even your own personal Dance Dance Immolation run. After paying for all the plumbing and parts for the flame effects, any additional funds raised past the $8224 goal will be put towards more fuel for the fire during Burning Man. Most of Syzygryd will be open-sourced. There are currently plans to release the collaborative grid sequencer (written in Processing), the plans for the AVR-based DMX to LED controller and flame effect relays, and Creative Commons licensed sets of sounds for Ableton Live. If the Kickstarter is successful, additional information including the fire tornado CAD drawings, the flame effects ignition system plans, and detailed fuel diagrams will be publicly released. This multi-disciplinary project is currently in full swing in community spaces across the Bay Area, including NIMBY, Noisebridge, and TechShop. Additional volunteers of all skill levels are always welcome. If you have interest in anything from music or electrical design to lighting, software, or metal fabrication and you want to work on one of the biggest projects at Burning Man this year, send an email to volunteers@syzygryd.com. If you’re a musician, familiar with Ableton Live, check out the MDK to get your music added to the sculpture. For more info on the project you can check out www.syzygryd.com and follow @Syzygryd on Twitter.